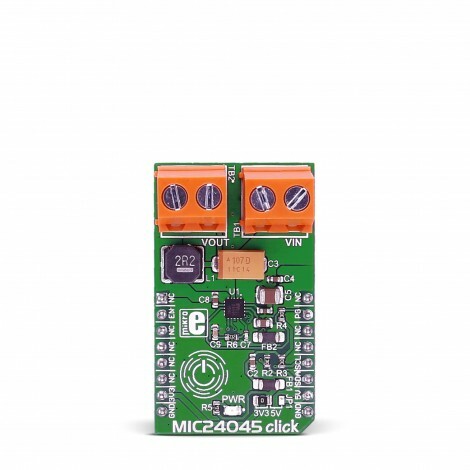 MIC24045 click carries MIC24045 I2C-programmable, high-efficiency, wide input range, 5A synchronous step-down regulator from Microchip. The click is designed to run on either 3.3V or 5V power supply. 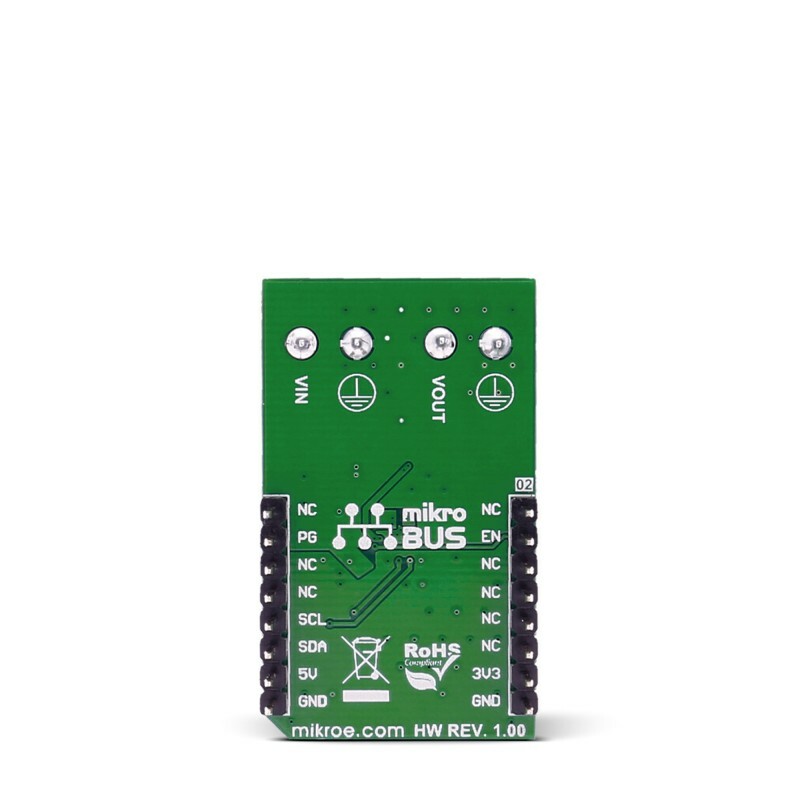 It communicates with the target microcontroller over I2C interface with additional functionality provided by the following pins on the mikroBUS™ line: RST, INT. 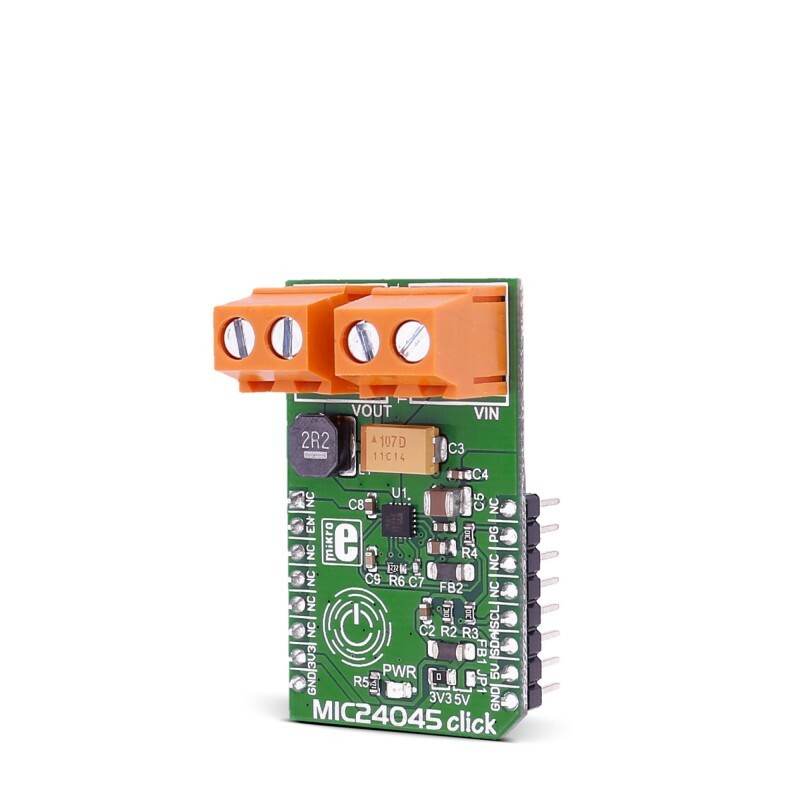 MIC24045 click carries MIC24045 I2C-programmable, high-efficiency, wide input range, 5A synchronous step-down regulator from Microchip. The click is designed to run on either 3.3V or 5V power supply. It communicates with the target microcontroller over I2C interface with additional functionality provided by the following pins on the mikroBUS™ line: RST, INT. 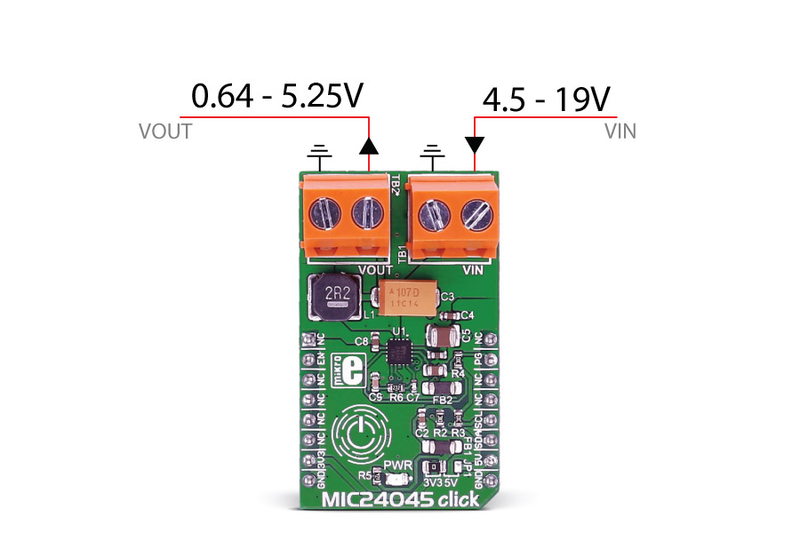 The MIC24045 is a digitally programmable, 5A valley current-mode controlled regulator featuring an input voltage range from 4.5V to 19V. The MIC24045 is perfectly suited for multiple voltage rail application environments, typically found in computing and telecommunication systems. The MIC24045 has a thermal shutdown protection that prevents operation at excessive temperature. The thermal shutdown threshold is typically set at +160°C with a hysteresis of +25°C. The MIC24045 features a Thermal Warning flag that is readable through the I2C interface (register polling is needed). The Thermal Warning flag signals the approaching of thermal shutdown, so that appropriate system-level countermeasures can be undertaken. The click is designed to lower the voltage on the input from 4.5V-19V to 0.64V-5.25V. The same voltage is used for powering the MCP24045 IC (TB1 and TB2 connectors). The voltage on the mikroBUS™ I2C pin can be either 3.3V or 5V, depending on the jumper position. 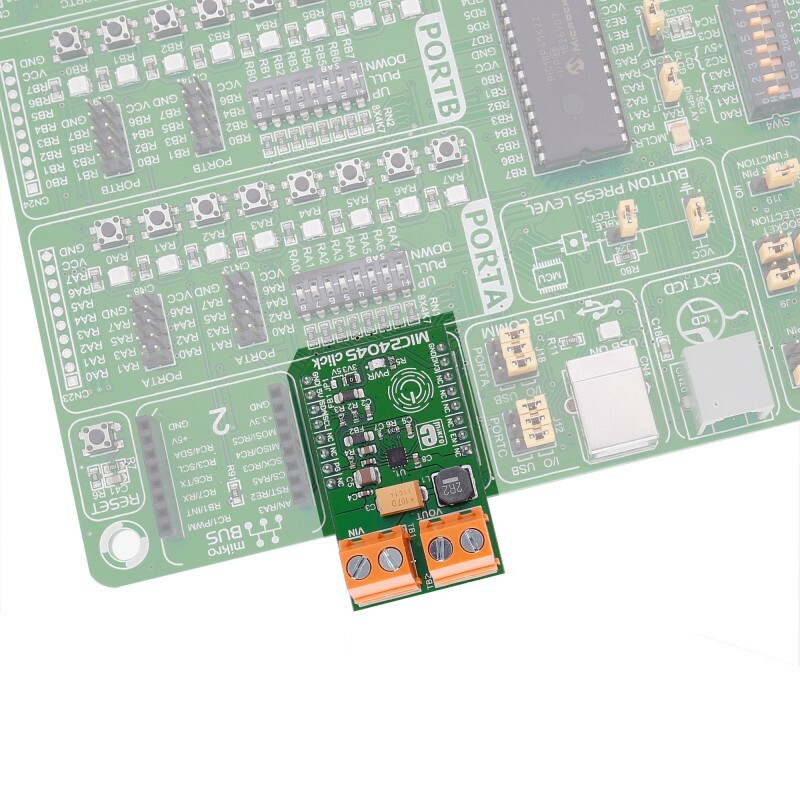 The selected mikroBUS™ power supply is used only for the pull-ups on I2C lines. This table shows how the pinout on MIC24045 click corresponds to the pinout on the mikroBUS™ socket (the latter shown in the two middle columns). Code examples for MIC24045 click, written for MikroElektronika hardware and compilers are available on Libstock. The following code snippet calls initialization functions, and then slowly decrements the voltage from maximum value down to the minimum.